in Leipold, etc. The course of developments in each followed a similar pattern. "Suomi Siirtola" - Finnish settlement - was the name of the land agency which existed briefly but managed to sell land in Jacobson to four Finnish families before it went out of business. The first to arrive on the scene were Alex Huhtala and Emil Siukola, who both came in 1903, Huhtala to the eastern shore of the Mississippi, Siukola across the river. Henry Huhtala wad the first child born here. their farms. When the settlement gradually became stabilized., the farmers of the region built a hall, and later the Finns alone built one of their own, a Farmers Hall. Another such hall was in Rabey, while Leipold even had its own workers' society, with 20 members in 1910. In 1950, a local chapter of the MFAHS was started in Jacobson, but it proved relatively ineffectual. 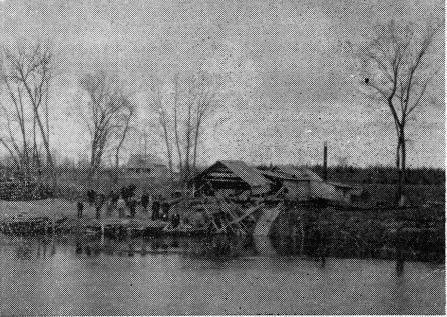 Emil Siukola's saw mill at Jacobson in 1910.